In 1917 Tom Bullock literally wrote the book on cocktails. He was an esteemed bartender at the Pendemis Club in Louisville, Ky and gained fame at the St. Louis Country Club thereafter. He became the first African-American to publish a cocktail book. This set is inspired by him. The recipes he published in The Ideal Bartender are still followed today because good taste never goes out of style. 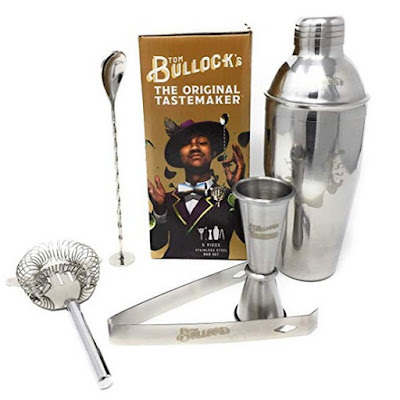 Use the Tom Bullock’s Cocktail Shaker set to make his recipes and more at your home or bar. Use the Tom Bullock’s Heavy Base Whisky Glasses to enjoy his recipes and more at your home or bar. And learn a little more about Tom Bullock because stories and entertaining go hand and hand! These will be great with Tom Bullock’s spirits, coming soon! Go to TomBullocks.com to be added to our mailing list. Site is under development. Please use these Amazon.com links below to purchase product. Cheers! 5 pc. Cocktail Shaker Bar Set by Tom Bullock's, The Original Tastemaker: 25 oz Stainless Steel Shaker, Double Measuring Jigger, Stirrer/Mixer Spoon, Strainer and Ice Tongs. Become The Ideal Bartender!